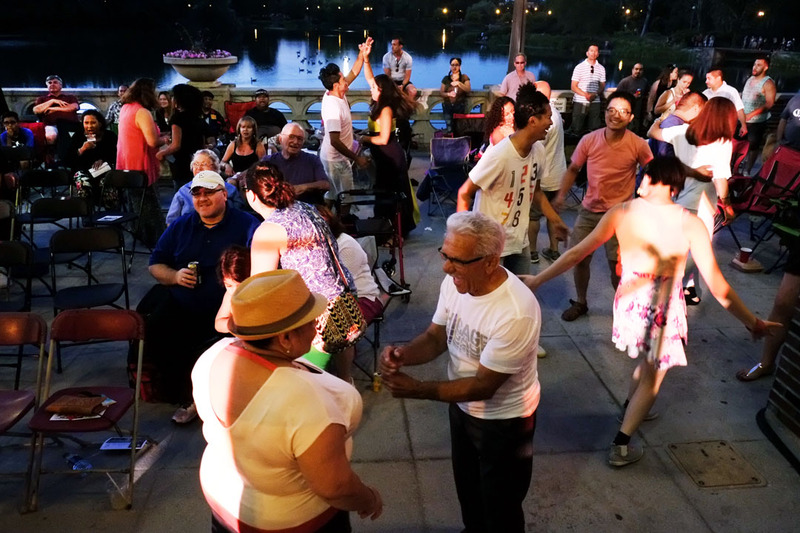 Latin Jazz dancers in Humboldt Park — photo by Lauren Deutsch. With a 10th annual Latin Jazz festival produced in the neighborhood Humboldt Park by the Jazz Institute of Chicago and dynamite downtown concerts with headliners such as Nigerian juju star King Sunny Adé and Afro-Cuban progressive Eddie Palmieri put on by DCASE, the city’s Department of Cultural Affairs and Special Events, Chicago’s free summer music programs are well underway. Add the Museum of Contemporary Arts’ weekly Tuesdays on the Terrace shows, conceded that Chicago’s unparalleled Blues Fest is already over (as is Taste of Chicago, where bands including The Roots prevailed) but note that the classically-oriented Grant Park Music Festival continues while the very promising 38th annual Chicago Jazz Fest looms to cap it all by Labor Day (we’ll also enjoy an early autumn Hyde Park Jazz Festival Sept 24th and 25th), and it’s hard to find a comparable wealth of beautiful sounds available to all comers, at least west of the Hudson River (NYC’s Summerstage highlights jazz this season, with quite a worthy schedule). Less the Chicago presentations simply seem like wannabe distractions from the local plague of gun violence, our failed mayorality and (gladly) “lost opportunity” to squander lakefront on a movie director’s museum, I hasten to say the concerts are genuinely positive, citizenry-binding events. While San Franciscan John Santos’ sextet, conguero Joe Rendon and Friends and Hector Silviera’s orquestra entertained on a stage set up in an open-air boat house, the surrounding, formerly dodgy Humboldt Park was bustling with family picnics and pickup-team games. Former (future?) 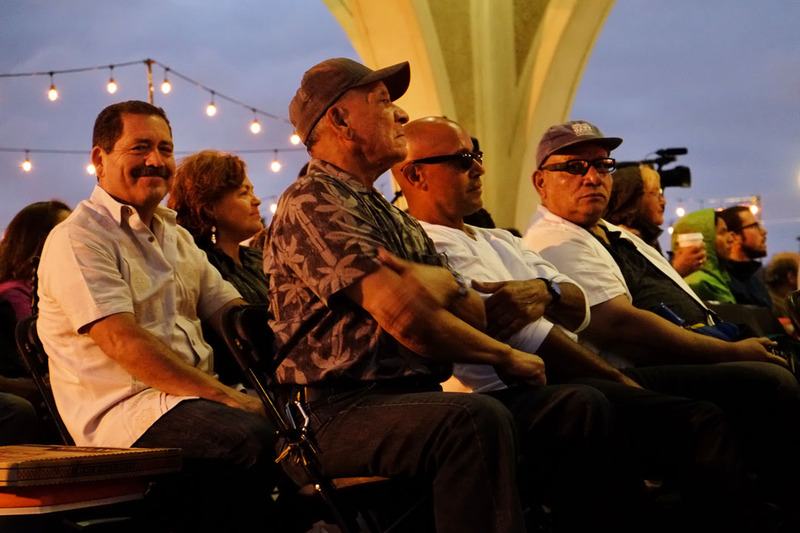 mayoral candidate Chuy Garcia sat comfortably amid the crowd (also for Palmieri’s Salsa Orchestra at Millennium Park), listening as a recognized, respected and unhassled member of the community. That community in all its glorious if too often uneasy diversity (approximately 1/3 African-American, 1/3 Hispanic background, 1/3 “non-Hispanic white”) has been well-represented at the Gehry bandshell of Pritzker Pavillion in Millennium Park. 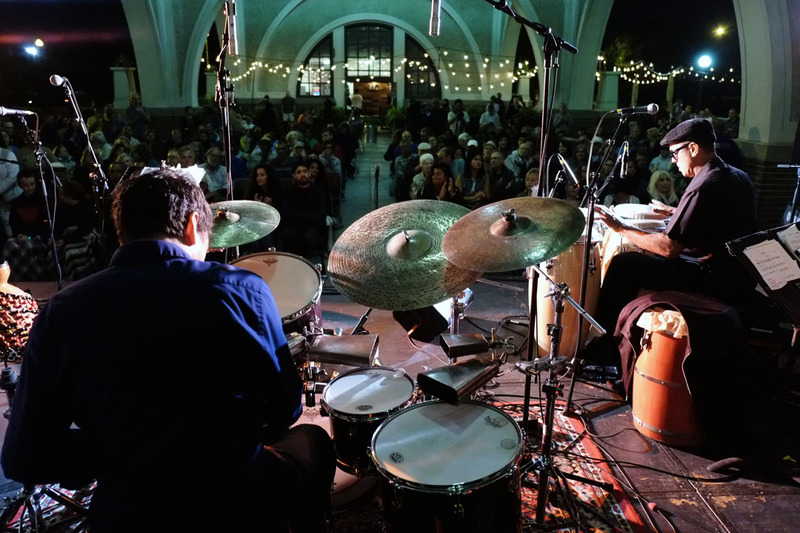 There were perhaps 500 people at the Latin Jazz Fest at Humboldt on Saturday, July 16, but an estimated 10,000 (capacity crowd) attended the powerhouse Palmieri show on June 27 — people of every demographic dancing to the uncompromisingly dense, percussive and melodically improvised roar alone, in couples and/or fluid groups. Two weeks later, Ugochi and A.S.E — her Afro Soul Ensemble — opening for Sunny Adé and his Afro-Beats, aptly emboding Chicago’s breadth of influences and depths of talent. 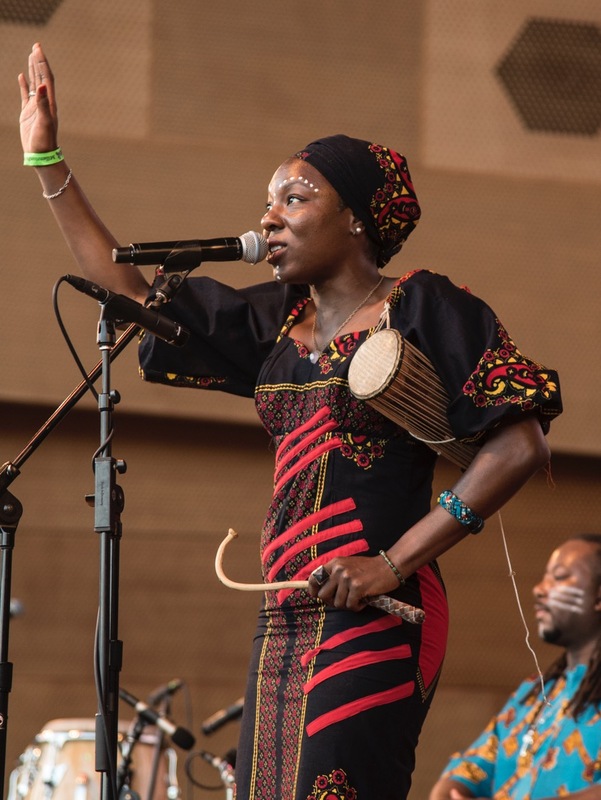 Born in Nigeria, Ugochi was raised on the South Side, and her relaxed yet keening vocalizations were like a junction of blues wailer Mama Estella Yancey with Malian Oumou Sangaré. Cellist Tomeka Reed, an emergent leader of the Chicago branch of the AACM (Association for the Advancement of Creative Musicians) joined the A.S.E. for two or three songs, adding a subtle creative undercurrent to the band’s mid-tempo renditions of their leader’s original material. Her lyrics were topical and inclusive (she introduced one as “three words my mother taught me that could save your life: ‘Don’t Mind Them'”). Judging by the crowd reaction, she won a lot of new fans. Although there is a percentage of attendees at Millennium Park who just come because it’s a nice place to throw down a blanket, break out some refreshments and stare at the skyline as night falls, DCASE’s programming ensures aficionados also have a reason to come to these gigs. King Sunny Adé probably drew on the basis of the fantastic tours he did in the 1980s — I heard him live three times in New York City, and will always (I hope) remember his concert at Roseland, where I discovered my body knew dance moves I’d never had tried before. In Brooklyn three years ago Adé and company delivered an eagerly anticipated but somewhat disappointing show — the ensemble appeared aged, heavy and weary — but in Chicago July 18 all parties onstage felt regenerated and ebullient. Adé will be 70 in September, but retains the dimples, grace and infectious humor that recalls at moments Cary Grant, Charlie Chaplin, Cab Calloway, Louis Jordan and Chuck Berry. He sings rather complicated story-songs casually, usually with support from two sidemen who contribute pantomime to the narratives (incomprehensible unless one speaks a West African language). He strapped on his Fender guitar for only one song, adding an spicy wham! to his figures. He moved from his hips, his knees, his ankles, precisely but self-deprecatingly. Meanwhile, the Afro-Beats tore it up, a terrific though un-announced electric guitarist reeling off skeins of single note lines that suggested he was familiar with Buddy Guy as well as Jerry Garcia and Jeff Beck, an electric keyboards player who didn’t offer predictable runs when he could build surprising improvisations, and a traps drummer pounding rhythms that defined the tunes’ long themes and releases. The entirety was founded on urgent talking drum parts — those seated musicians started hot and never slowed down. Oh, there were two bodacious women dancers, too, shimmying in golden dresses. 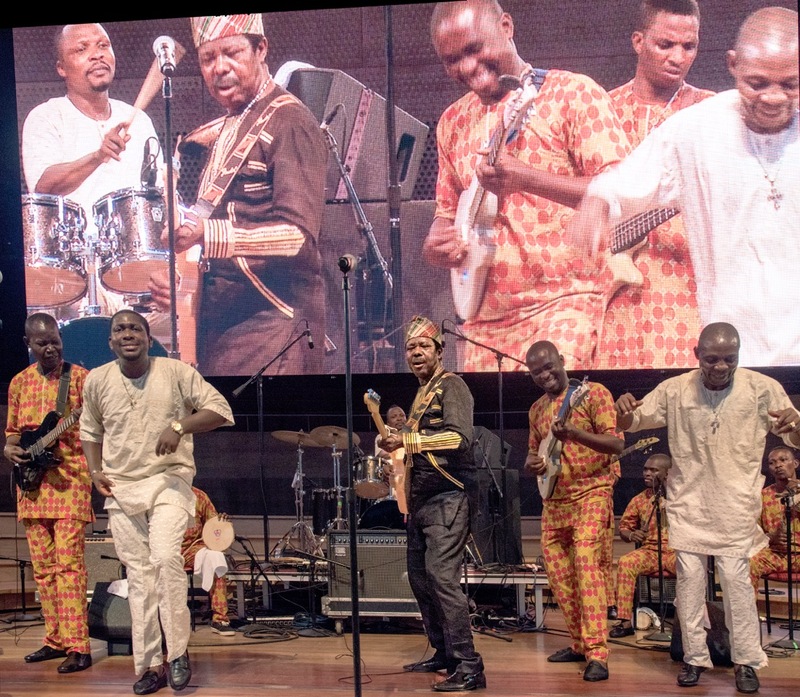 In how many American cities does Sunny Adé’s audience, unbidden, sing along in Yoruba? How does an age-and-ethnicity-mixed mob of Chicagoans even know the material of a group that hasn’t visited in decades, and gets scant-to-no radio play? We can’t do much about intransigent Republican governor Rauner, hapless and unpopular Rahm Emanuel, hand-gun fueled gang wars taking a toll on innocent bystanders, but we can gather to hear music that brings everyone together and makes us happy. Tomorrow (July 21): The Heritage Blues Orchestra, with my friend Junior Mack singing and playing guitar, and Toshi Reagon, free, starts at 6:30 pm. 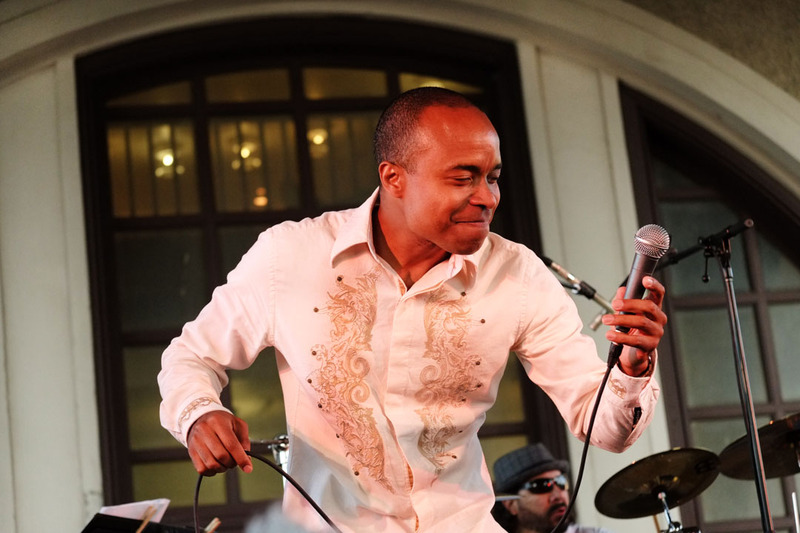 Thursday and Friday, July 22 and 23: Marin Alsop conducts the Grant Park Orchestra in Dvorak’s New World Symphony, and violinist Regina Carter performs Duke Ellington’s orchestral works; next week (Tuesday, July 26), saxophonist Caroline Davis and pianist Rob Clearfields’s quartet at the Museum of Contemporary Art, 5:30 to 8 pm (free only to Illinois residents). More to come!